Pressure to publish research in international journals may be driving researchers away from undertaking research specific to New Zealand, according to TEU’s national president Dr Sandra Grey. Government research funding (PBRF) rewards published and cited research, and that means that researchers who publish in large international journals will tend, on average, to rank better (and thus draw more research funding) than researchers who publish in small domestic journals. Dr Grey is concerned that Marsden Grants over recent years may indicate a decline in New Zealand-specific research since the introduction of PBRF. Between 1998 and 2000 about 16 percent of Marsden research grants clearly identified they were specific to New Zealand in their title. The number of research grants with titles that clearly identified they were specific to New Zealand has fluctuated since then, but appears to be falling. 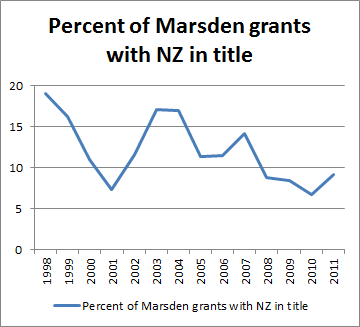 In the last three years (2009-2011) only 8 percent of Marsden research grants had titles that clearly identified they were specific to New Zealand (see graph below). Dr Grey says there is a hint here that New Zealand research (or research that does not specify a link to New Zealand in the title) is not featuring as highly in Marsden research grants since around 2005. “As with any high-stakes measurements you get what you reward. Our current research ranking system may be putting New Zealand research under threat,” said Dr Grey. Training Incentive Allowance cuts to be reconsidered? View videos of David Robinson’s Auckland and Christchurch (Part 1 andPart 2) ‘Vandals at the Gate’ lectures. The CTU condemned an announcement by Ports of Auckland yesterday that it intends dismissing over 300 port workers and proceed with contracting out their jobs. Helen Kelly, CTU President, said “It is an outrageous approach to bargaining for the Port management to say – accept every change we want in the collective agreement or we will sack all of you and replace you with contracted labour that has to accept every one of our demanded changes in hours of work, and rosters, and reductions in so many other conditions of work essential for safety and job security” – CTU.